Many people say that you cannot possibly come to Belize and not have some kind of a big adventure. I have to agree. My first visit to Belize was in 1995. I vacationed for a week of scuba diving off Glover’s Reef. I met my Belizean husband, Marcos, during that trip, and he moved to Santa Fe, New Mexico with me in 1996. I was a practicing psychotherapist and my husband launched a small business. We enjoyed living in Santa Fe, but were intensely busy virtually all of the time. We traveled to Belize every year and explored the country in depth over the next 17 years. We knew our hearts belonged to this small nation, with its laidback lifestyle and friendly people. The breakneck speed at which life had to be lived in the U.S., raising two kids and running two businesses while maintaining a house eventually took its toll. 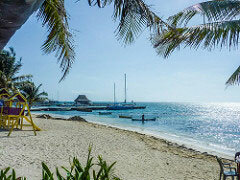 In 2013, we made a permanent move to San Pedro, on Ambergris Caye. The beauty of the crystalline turquoise water, gorgeous weather, and active and thriving English-speaking community is something I still appreciate. Visiting Belize many times over the years didn’t prepare me for actually living on this tiny island. When we initially moved, the first few months were a lot like an extended vacation in an amazingly beautiful location. However, as time went on, my focus changed, and I began to see myself as a part of a vibrant and diverse community. Islanders ride their bikes or drive their golf carts and wave to everyone they know along the way. Today, we happily drive our golf cart around too. I love that drive into town, which happens each day…it means seeing lots of people and making social arrangements on the road. Rent is our biggest expense at $1,000 a month for a new, well-designed apartment that has all the modern amenities we need. We are a five-minute walk from the beach and have beautiful trees and plants and a neighborhood that has a mix of locals and expats. We have a huge veranda, and spend lots of time outside gardening, grilling or just relaxing with a glass of wine. 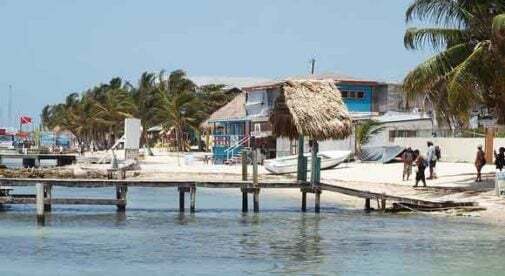 In San Pedro, on the island of Ambergris Caye, Karen and her husband enjoy the turquoise waters, excellent weather, and laidback lifestyle in Belize. Utilities are about one-half of what we were paying in the States, and services of all sorts are very inexpensive. Food can be expensive (as this is an island, things have to be imported) until you learn to shop for what is fresh and available on any given day of the week. Initially I was concerned about the quality of healthcare but was surprised to find that it’s excellent, and healthcare professionals seem to actually “care” about their patients. Belize doesn’t have the level of technology available in the States, but their medical professional’s skills combined with a caring attitude go a very long way. I have yet to visit a healthcare professional that did not give me their personal cell phone number…which they actually answer. Medical care costs about one-fourth of what it costs in the States, and can be free at the local clinics. Belize is a country I know I will never be able to stop exploring. The incredibly diverse population compliments the natural world of warm, clear, turquoise Caribbean Sea, lush green rainforests, mountains, rivers, cave systems, and Maya ruins. Since moving here I’ve taken up water aerobics, cooking, reading and made some very good friends on the island. But my incorrigible desire to be in business drove myself and my husband to buy a boat and set up our own tour operation based in San Pedro. We’ve kept it small and intend to continue to do so…which is the antithesis of how we operated in the U.S.